A new version of Nemo Documents has quietly been rolling out today. This version is a culmination of things we wanted to get in before 1.0, together with a relatively large number of bug fixes. One of the most prominent new things in this release is that labels now have colors (and yes it is possible to change the color :)). Secondly marked items now look a bit nicer, and we have made it even easier to label files by simply dragging them onto labels. After the update, and following the re-index, no documents show up at all on my NEMO weekly sheet (or daily or monthly). What to do? Very strange. I have tried reindexing here and it works fine. Maybe you by accident put in a restriction, like selecting a file types, folder? Or maybe you searching for something (top right corner)? If that doesn’t help try restarting the program. Hi, I just installed Linux Mint 14 64-bit Cinnamon on my computer, and if I get it right nemo is the default file browser on mint. Very happy about it, apart from the fact that I can’t colour-label folders or documents from the right-click context menu. So I found Marlin File Browser in the meantime that seems to have this option. But I’d prefer to stay with Nemo. 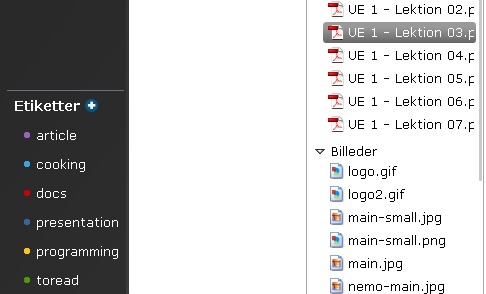 From what I understand from above it is possible to label (and colour-label) files and folders in Nemo? If so, could you explain me how? Hey Anders, thx for your answer – and sorry for my mixing up things!